I’m sure you’re thinking, what do board shorts and jerked tofu have to do with Disney World, this isn’t Jamaica. Well let me tell you! This is a review of our dinner at Jiko the Cooking Place in the Animal Kingdom Lodge Jambo House from May 2014. I’m sure you’re still confused, don’t worry, I’ll explain. 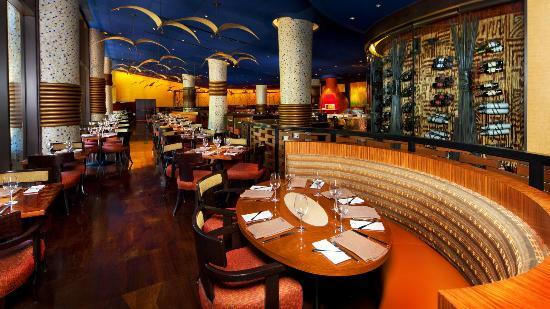 Jiko is an upscale restaurant located next to Boma in the Jambo House at Animal Kingdom Lodge. This restaurant is so upscale they have a dress code, which they apparently don’t enforce. Corey and I were excited to eat somewhere that required us to look nice since we have no fancy vegan dining options at home. We were quickly disappointed when I spotted a man and his child, who appeared to have just come in from the pool, being seated. Now I’m not typically a snob about these things, I like being comfy too, but if your restaurant states out front that you have a dress code, you should probably enforce it. That being said, if you go to Jiko please actually follow it, it’s nice to dress up sometimes. Jiko drew us in because they have a full vegan menu! One major draw back for most people for Jiko is that if you are using the dining plan you will use two sit down credits. Since it’s two credits we were anticipating an expensive vegan meal. All of the vegan entrees are $29, which seems like a lot until you compare it to the actual Jiko menu with items ranging between $30-$46. The decor of the restaurant was really neat, not overly African but felt like an upscale restaurant. It was pretty dark where we were sitting, which was a bummer for us taking photos of our food and menu. I will write out the full menu we were given at the bottom of this post. Where we were sat we could see the chefs creating the pappadam and other breads. There is also an option to sit at the bar there and watch them. If you’re traveling alone, that’s a good option! We decided to order an appetizer because we were really hungry. We went with the Taste of Africa which was a collection of four dips and lentil pappadam. 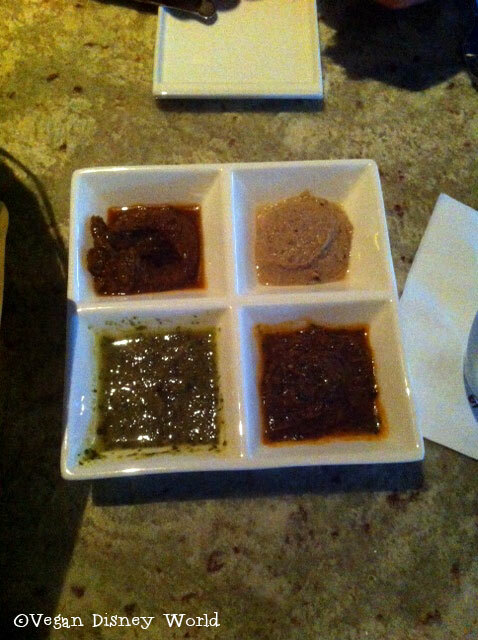 The four dips were Bhuna Masala, Sagh Dahl, Moroccan Chermoula and Kalamata Hummus. The Bhuna Masala was pretty spicy, it helped clear my sinus cold pretty quickly. The pappadam was really good and crispy, we ate it all pretty quickly, which is why there are no photos of it. 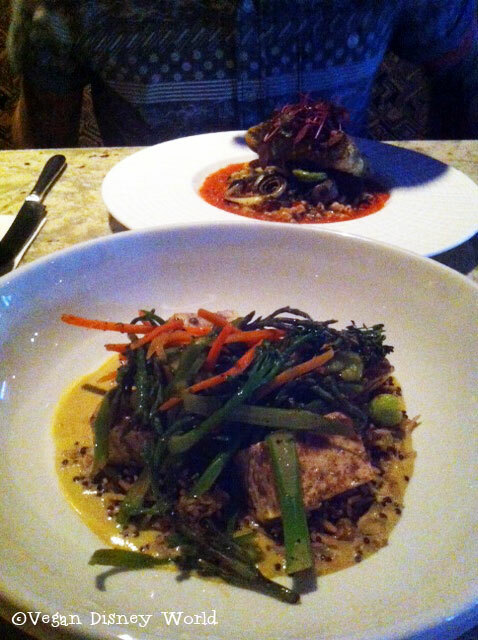 For our entrees I went with African “Jerked” Tofu and Corey had Maize-Crusted Seitan. My jerked tofu was super spicy, the coconut curry and vegetables definitely helped to cool down the flavor. The tofu wasn’t very firm, but being someone who is used to all sorts of tofu I didn’t mind. The vegetables in it were seasoned and cooked perfectly. As a whole I really enjoyed this dish. Thank goodness the coconut curry was there otherwise I would not have been able to handle the jerk sauce. There was also red quinoa through out my dish that added a nice texture to my meal. The Maize-Crusted Seitain came with grains, vegetables and chakalaka. Corey did not seem to like his dish as much as I enjoyed my own. He felt that the seitan was rubbery and not as firm as it should be. There was also a bit of a flour residue on the crust of it. He liked the vegetables more then the seitan which was a bit of a let down for him since he was excited to try some seitan from a restaurant that didn’t appear to be Gardein. He felt that his meal was definitely not worth $30. As a whole, Jiko was an interesting place to check out. We had both been wanting to go there for quiet some time and finally made it while on our wedding trip. The atmosphere was nice, and it was really great to go to a “fancy” restaurant and enjoy a fine vegan meal. If you are going for a special occasion I would recommend making a stop at Jiko for a romantic dinner, just please, PLEASE, follow the dress code. Also if you are using a dining credit, I would just pay for this restaurant rather than use two credits. We have had more expensive dinners that were just one dining credit then our total meal cost at Jiko. Yes, just not as a every time we go ADR (advanced dining reservation). It would be nice to go again for an anniversery and when I don’t mind spending a lot on dinner. With this being a fancy place do you think they’d mind if you chose to eat a flat bread, appetiser and dessert, rather than an entree? Not at all, it’s your meal! I haven’t been to Jiko yet, but would really like to go. I have been to Sanaa a few times and love it there. I have tried I number of the options on the vegan menu and haven’t found anything that wasn’t amazing so far. I love the spices and flavor combinations that they use. I really want to try Jiko though it seems like they use the same flavors in a more sophisticated way. And I have to admit the separate vegan menu is a major plus for me. Hopefully I can talk my family into going with me at some point. I felt the same way when we had Sanaa, I wanted to like it more then I did. When it came down to comparing Sanaa and Jiko I definitely liked my meal from Jiko more then Sanaa. I hope you can try it out some time!